Mary Kamanzi is the founder of the Arise and Shine School and National Director of Youth With A Mission (YWAM) for Rwanda. The Arise and Shine School is among the premier private primary schools in Rwanda and has a vision to disciple the nation of Rwanda by laying a strong foundation through quality Christ-centered education. The school aims to promote creativity and freedom by empowering children to become honorable, capable and servant leaders that will impact all spheres of society. Mary has worked in education in South Africa, Uganda, Kenya, and Rwanda, and was appointed to a government commission: Committee for Unity and Reconciliation. 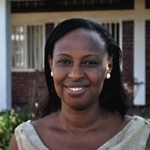 She also sits on the board of Vessels of Honor, a ministry to women leaders in Rwanda. Having graduated from the Uganda Teachers College in 1985, Mary went on to earn degrees in Child Social Services and Family Ministries from the University of the Nations.